Yeah, so the title may be a bit confusing, but it’s more or less an accurate summary. Basically, AT&T released a (promo?) 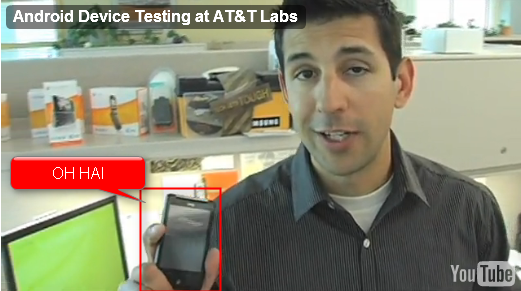 video detailing their testing procedure for Android phones, in which Dante Martin, a device product manager at AT&T, waves around a HTC Android handset that looks a whole lot like the Aria whose leaked pictures were outed a few weeks ago. In addition to those leaked pictures, ROM developer Coinflipper sent Android Central a render of a HTC device dubbed the ‘Liberty’. 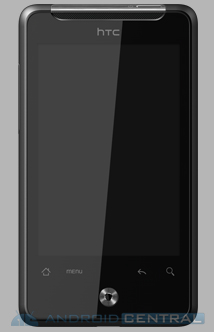 The device in the render is very similar to the device in the leaked Aria picture, and the user-agent for both the Aria and the Liberty both show a 320x480 resolution, indicating that they may be the same phone. 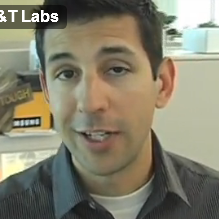 Back to the video, if you watch it carefully you can catch a few brief glimpses of the diminutive candy bar handset. No details about the phone itself are revealed in the video, but it’s fairly clear after seeing the leaked pictures and renders this past week that the phone is either the Aria/Liberty, or a pretty damn good imposter. I’m not sure I could reasonably use a touchscreen only device with such a small screen. The virtual keyboard on that thing has to be fairly cramped, and I have enough trouble as it is with the virtual keyboard on my Nexus One. What do you guys think? Does size really matter?